Mike's Hauling Services is a full service junk removal and haul away company that cleans up residential and commercial properties in Lorain and Cuyahoga counties. Mike's professional junk removal crew will clean up, remove, dispose & recycle any and all unwanted items. Everything involved in disposing your unwanted materials is handled by the crew, and you can sit back and relax while they clean up your source of stress!! The only finger you lift, is the one to point to the mess! Reasonable, reliable, and really fast. Unlike any other hauling company out there! Personality, Reliability, Expertise, Low Prices, 10 years experience, and a major passion for the industry. Best priced hauling company in this area. Look it up, prove it to yourself, you're not going believe it coming from them! Mike has done the research and has competitively low prices for high-quality work. 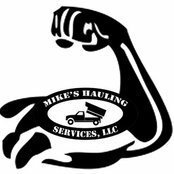 Mike's Hauling is a company built by a young Northeast Ohio entrepreneur, since 16 years old Mike has had a passion for recycling and disposal. This company's methods are in the best interest of the local environment and the customers budget! Visit our Facebook Page, or Angie's Listor Google or Yelp andThumbtack. Plenty of information and testimonials about our company! Feel free to check them out and add to them as well! Any and all support helps our local business strive and thrive. Our online reputation is very important to us and important to you! Call now!